Match the power of an IRA with the power of an index fund and good things should start to happen. Here are three great options. Index investing and individual retirement accounts (IRAs) go together like peanut butter and jelly. Picking the right index-based ETFs, however, requires some finesse, since the right fund will depend on your life situation and investment approach. PowerShares S&P 500 High Dividend Low Volatility Portfolio (NYSEMKT:SPHD), Vanguard Small-Cap Growth ETF (NYSEMKT:VBK), and SPDR S&P Dividend ETF (NYSEMKT:SDY) are three very different options to consider. Depending on where you are in life and how you prefer to invest, I think you'll find that at least one of these three picks from Fool.com contributors could be a good fit for your IRA. Neha Chamaria (PowerShares S&P 500 High Dividend Low Volatility Portfolio): PowerShares S&P 500 High Dividend Low Volatility Portfolio is an index fund that offers both high yields and low levels of volatility. It’s a super easy way to supplement your income in retirement and great for putting in an IRA, particularly a Roth IRA. The fund's name says it all: It's a basket of high-yield dividend stocks that are also less volatile. So what stocks are we talking about here? The fund tracks the S&P 500 Low Volatility High Dividend Index, which is comprised of the 50 highest-yielding stocks from the S&P 500 index that were also the least volatile based on the standard deviation of daily stock prices during the trailing 252 trading days. Not surprisingly, the fund has significant exposure to a mix of defensive and income-heavy sectors like utilities and real estate investment trusts (REITs). As of April 6, nearly 57% of the fund's total portfolio was allocated to utilities, real estate, and consumer staples. REITs HCP Inc. and Iron Mountain were its largest holdings, with a 6.15% combined weight. The recent pressure on REITs and utilities in a rising interest rate environment has hurt PowerShares S&P 500 High Dividend Low Volatility Portfolio's returns, but it has also pushed its 30-day yield to 4.2%, handily beating the S&P 500's dividend yield of around 1.8%. To be fair, the fund's expense ratio of 0.30% isn't the cheapest in the ETF space, but the combination of high yield and low volatility makes it a great choice for your retirement fund if you are ready to start pulling money out of your account. Jason Hall (Vanguard Small-Cap Growth ETF): While it may seem like your IRA should be invested in "safe" assets like bonds or blue chip dividend stocks, the truth is, those kinds of investments can lead you to poor long-term returns and retiring without a large enough nest egg. At the same time, more volatile investments like growth stocks aren't as risky as you might think, as long as you are able to buy and hold for the long haul, riding out the occasional downturn and profiting from the long-term gains. VBK Total Return Price data by YCharts. There will be short periods of time when small-cap stocks underperform the market. But over the long term, this class has historically outperformed, and that makes this Vanguard fund an ideal way to gain exposure to small caps for long-term growth. Reuben Gregg Brewer (SPDR S&P Dividend ETF): If you love companies with incredibly long histories of increasing their dividends as much as I do, but don't want to put in all the work to build and monitor a portfolio, then the SPDR S&P Dividend ETF is worth a close look. Only companies that have increased their dividends for 20 years or longer make the grade here. That helps ensure the portfolio is focused on companies that have proven they have what it takes to survive in good and bad markets while continuing to reward investors with dividend hikes all along the way. The stocks that pass this fairly stringent screen (currently 111 names) are then weighted by dividend yield. It's important to note, however, that a high level of income isn't the goal of SPDR S&P Dividend ETF (the trailing yield is only around 2.3%). The goal is to bias the portfolio toward out-of-favor names. This value-driven approach is vastly different from the market weighting of the S&P 500 index, which tends to be biased toward the most favored names at any given time. In retirement or out of retirement, the mix of dividends and value here makes this an interesting ETF option. 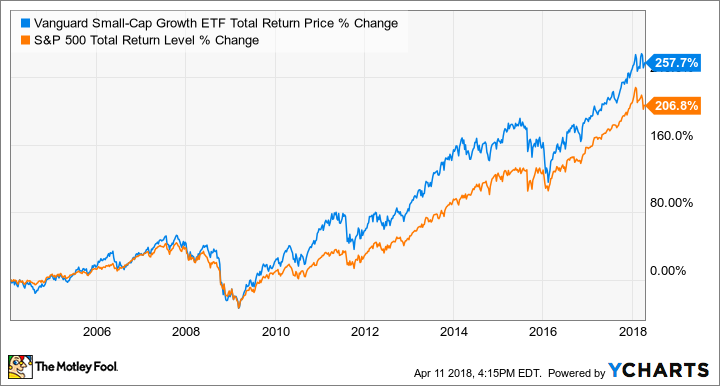 The fund isn't cheap, with an expense ratio of 0.35%, and it has lagged the S&P 500 index over the past couple of years (that's not surprising based on the weighting methodology). However, there are some reasons to like it just the same. For example, its beta is around 0.80, suggesting it is roughly 20% less volatile than the broader market. And while the yield is modest, it is still higher than what you would get from a fund like S&P 500 Index ETF, which offers a trailing yield of just 1.85%. Of the many dividend ETFs out there, I think this is one of the most interesting options. The kinds of ETFs you put into your IRA depend on where you are in life. If you are building up to retirement, then small-cap-focused Vanguard Small-Cap Growth ETF could be an ideal way to invest for the long term. If you are in retirement, and trying to maximize your income and reduce risk, then PowerShares S&P 500 High Dividend Low Volatility Portfolio is a great high-yield option. 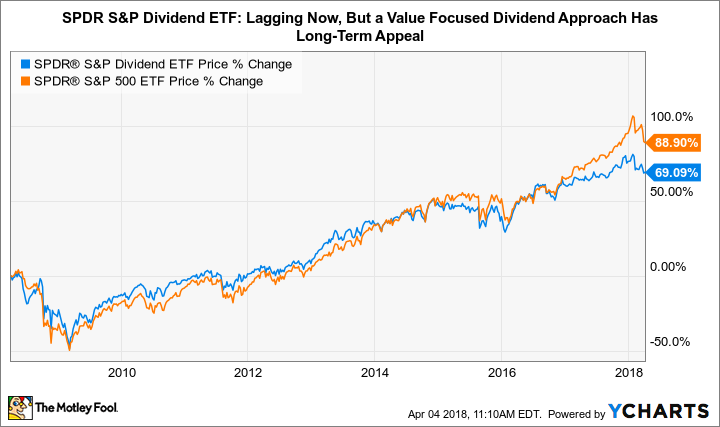 And if you are looking to add a value bias to your portfolio while focusing on companies that have incredible dividend-paying histories, then SPDR S&P Dividend ETF could be the right call.